You can choose between Cub, Bronze, Silver, Gold and Platinum level adoptions. All adopters receive a customisable pack of materials as well as invitations to exclusive events. Find out more about what is included within each level below! Scottish wildcats (Felis silvestris grampia) may look similar to a pet cat, but has some differences. The wide, flat head, ears pointing more sideways, a bushy blunt-ended tail encircled with dark rings, and a distinctly striped coat all distinguish the true wildcat from feral cats. Research has also revealed differences in their genetic make-up, blood type and skull features. Found in upland forest, moorland, scrub and hill ground where they can lie up during the day. The wildcat is a useful predator of pests such as rabbits and rodents and will also eat birds, reptiles, amphibians and insects, they may also scavenge fresh road casualties. Solitary and territorial, the wildcat is active at night particularly around dawn and dusk. Scottish wildcats are now one of Britain's rarest mammals due to many threats with the biggest being interbreeding with domestic cats. The Scottish wildcat is currently listed by the International Union for the Conservation of Nature (IUCN) as critically endangered as it is thought that there may be as few as 400 left - making them rarer than the Amur tiger! 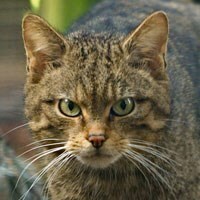 Our Scottish wildcats are part of the European Studbook Programme. Which level of adoption would you like to purchase? *Please note if you live outside of the EU, Liechtenstein or Switzerland we are unable to post seeds, and will instead send an RZSS branded notebook. Are you buying this for someone else? Yes, I am buying for someone else. No, I am buying this for myself. Unless a specific start date is entered, adoption starts immediately after purchase. Delivery of adoption pack can take up to 10 business days. If a start date is specified, the adoption pack will arrive in time for that start date, provided that the specified start date is 10 or more business days after the date of purchase. If you are a UK taxpayer, the value of your donation or eligible adoption fees can increase by an extra 25% under the Gift Aid scheme – with no additional cost to you! Please select below to join the Gift Aid scheme. Would you like to Gift Aid your donation? I would like the RZSS to reclaim the tax on this donation from me and my immediate family. I confirm I have paid or will pay an amount of income tax and/or capital gains tax for each tax year (6 April to 5 April) that is at least equal to the amount of tax that all the charities or Community Amateur Sports Clubs (CASCs) that I donate to will reclaim on my gifts for that tax year. I understand that other taxes such as VAT and Council Tax do not qualify. I would also like to Gift Aid all donations I have made to the RZSS in the last four years and all donations in the future until I notify you otherwise. Would you like to make a donation to RZSS's charitable work? I have read Edinburgh Zoo's adoption terms and conditions.